Large commercial insurance placements present a unique set of challenges. In the article below, Aon examines the issue and discusses a solution. An insurance policy is a promise. If something bad happens, your insurance contract promises to indemnify you – or make you whole – in response to a loss. As an individual, this can be relatively straightforward: If you wreck your car, the physical damage coverage on your auto policy promises that your auto insurer will fix or replace your vehicle up to the value of the car before you crashed. This same principle applies in the commercial world, but as the severity and complexity of risk increases, insurance programs become more complicated, often requiring multiple insurers to achieve the level of capacity and coverage needed. As a result, executing on the promise to pay can start to resemble the popular block game of “Tetris.” In “Tetris,” significant numbers of different shaped pieces need to come together to form a single block on the game screen. As long as you manage to make everything fit, you succeed. However, if one of the pieces doesn’t fit, your next move potentially becomes much more difficult. Similarly, if one of the insurance contracts in your program doesn’t align with the others, a future claim might become unnecessarily complicated, challenging your ability to restore the value of your insured asset. Two major forces drive the layering and structuring we see on large commercial insurance placements. First is the need to secure the coverage and capacity required to protect the interests of a business – both first-party interests like buildings and property, and third-party liabilities arising from potential disputes and claims from others outside the business. Second is the need to secure this insurance capacity at a competitive price due to the expense pressures companies typically face. Let’s look at capacity and pricing and how these dimensions of an insurance program are being addressed in today’s market. Capacity: As we move beyond the primary or working layers of an insurance program, or attempt to cover risks where aggregation becomes an issue across exposures or clients, insurer capacity constraints come into play. To limit exposure to a major liability claim or natural disaster, individual insurers may only be willing to offer a fraction of the desired capacity. As a result, fitting the pieces together to create a fully insured program may become a far greater challenge for insured clients and their advisors. Pricing: The task of pricing further complicates an insurance program. Not only do the various layers of a program typically have different shapes – in the form of differing attachment points, limits, wordings, subjectivities, etc. – they also have different prices, driven by basic supply and demand, with the overlay of individual underwriting judgment. Furthermore, pricing within a program can vary significantly based on insurers’ risk appetites and underwriting guidelines. Benchmarks, increased limit factors and other tools can be helpful, but these rely on other price points with the same challenges. With this in mind, there are solutions open to insurance brokers if they are prepared to innovate. In particular, we believe these include the following steps to simplify and improve the process of obtaining appropriate insurance cover. From the client’s perspective, we need to create bigger and more uniform blocks of capacity and reduce or eliminate any ambiguity in the pricing mechanism. From an insurer’s point of view, we should identify and analyze portfolios of risks with adequate scale and diversification to provide the insurer with the level of confidence needed to expose their capital at competitive terms. This is where portfolio solutions can play an important role in structured placements. By combining the strengths of individual insurers to create larger blocks of contiguous capacity, we can address many of the issues you face as a client, while also providing insurers with sustainable business that continues to attract their commitment. It would be like pre-designing the “Tetris” pieces to fit together perfectly. The game might be less exciting to play, but a successful outcome would become the norm. In response to these challenges, we launched the Aon Client Treaty in January 2016. By harnessing the scale and diversity of our business in London, unprecedented leverage of data and analytics, and world-class broking capabilities, we developed this innovative solution unique to Aon clients. 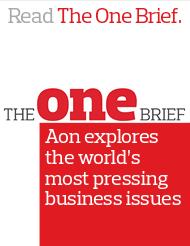 With limited exceptions1, the Aon Client Treaty provides guaranteed 20 percent capacity on all orders placed through Aon’s Global Broking Center in London. The coverage is full follow-form on terms, conditions and pricing of the London lead market. 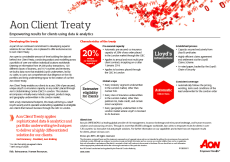 The Aon Client Treaty is a multi-year solution supported by a panel of highly regarded Lloyd’s syndicates. Led by XL Catlin, the Aon Client Treaty provides clients with the full benefits of the Lloyd’s chain of security, broad licensing and claims scheme. Is it more likely to respond favorably to a claim? Will it still be available, even after a difficult claim? Does it simplify the structure of the placement? Can it help with the pricing and terms of other participation in the program? Will it support you if the market turns unexpectedly? Thanks to the Aon Client Treaty, your risk program can now be assessed not just as an individual risk, but also as part of a larger portfolio of insurance policies that qualify for pre-negotiated features and benefits unavailable in the open market. This is made possible by the scale and diversification of Aon’s London portfolio; the magnitude of which means insurers have the ability to look at factors besides the performance of your specific, individual risk. This level of familiarity and resulting comfort with the Aon portfolio were built through extensive pre-launch due diligence on the exposure base and loss performance of the current London book of business. The launch of the Aon Client Treaty signals an exciting breakthrough for the industry, and provides clients with innovative solutions to strengthen their ability to manage risk. Aon continues to invest in portfolio solutions, as they will become even more prominent elements of client insurance programs where structured capacity is required to meet evolving needs. This virtuous cycle allows clients and insurers to benefit from the sophisticated analytics and solutions made possible by the scale and diversification of the Aon portfolio, which in turn enables Aon to develop even more compelling solutions. We invite you to learn more about the Aon Client Treaty and the options to help reshape your program going forward. Please ask your Aon Account Executive or Broker, or reach out to the Aon Client Treaty team members listed in the right column on this page. While insurance capacity might be a commodity for many these days, effective insurance solutions are not. When it comes to your insurance program and the potential for a large claim, isn’t it better to know beforehand that all the pieces fit together and the odds are stacked in your favor? 1Exclusions include trade credit and political risk. Also, the Aon Client Treaty must follow an approved London lead. For additional information on terms and conditions, please contact your Aon representative.